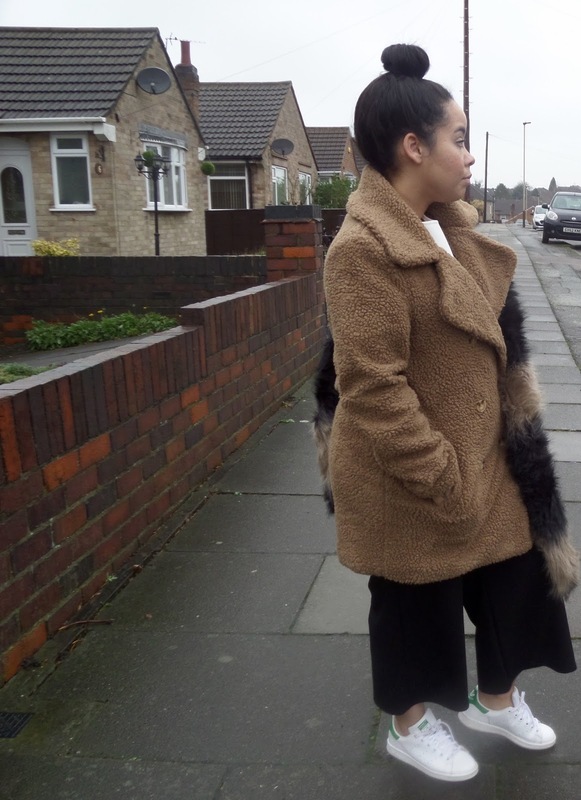 Teddy coat - Missguided. Neoprene top - Misguided. Flare trouser - New Look concession sale (similar). 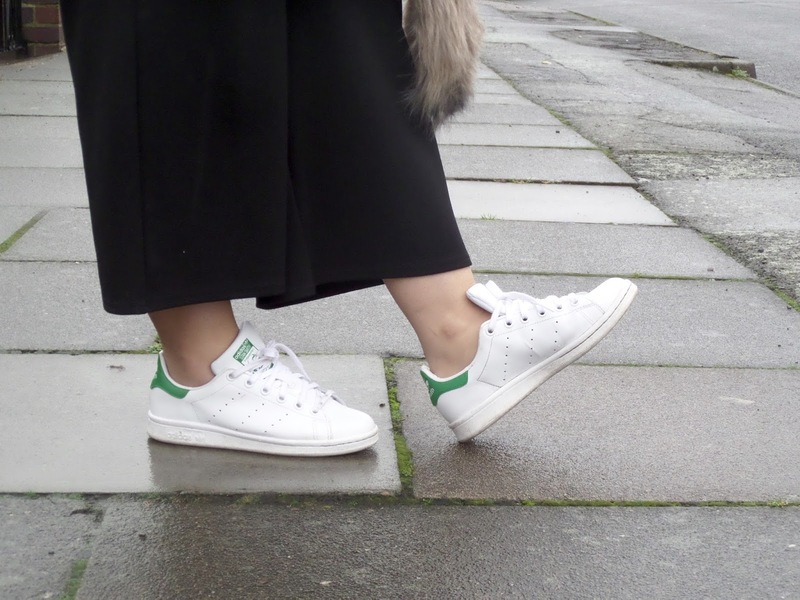 Trainers - Adidas Stan Smith. Fur scarf - New Look. How is it mid-January already? How? How? I seriously feel like Christmas came, I blinked and now we're mid way into January. And it sure is cold. Probably a good thing i've been stocking up on all kinds of coats. 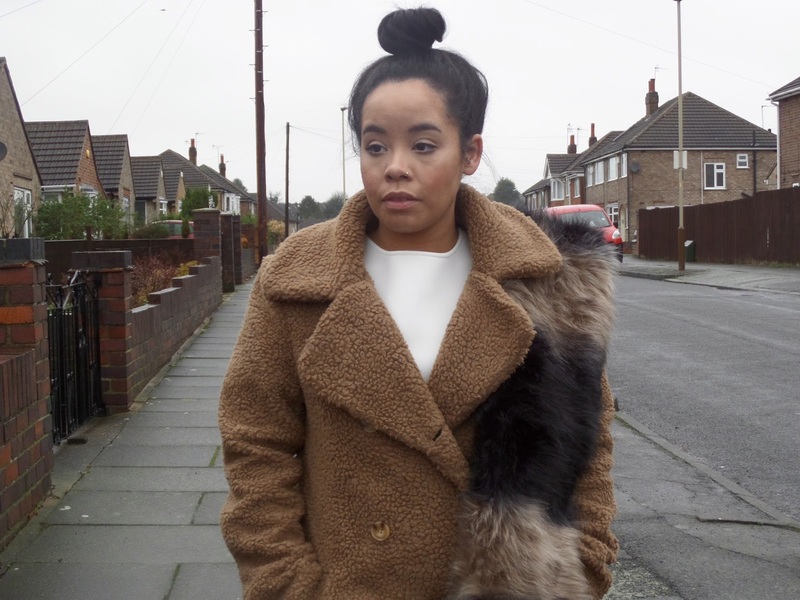 I absolutely adore this camel shearling coat from Missguided. 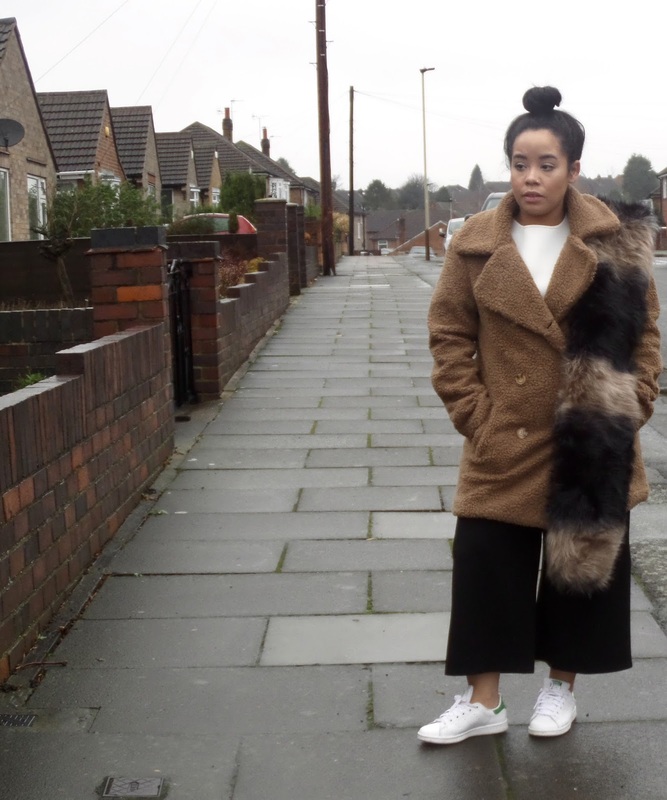 It's super cosy and surprisingly pairs so well with a multitude of different outfits. It's a modern item with a vintage feel. Now, i'm not really one for New Years Resolutions, as I tend to stick to them for about 5 minutes (Oops, may bad!). But what I am trying to do this year is focus more on my blog. My posting schedule, or lack thereof, is pretty non-existent. I find working full time and learning to drive on weekends, it can be quite hard to find time to put in the effort this space deserves. With that being said. Going forward, I am hoping to post 2/3 times a week. And also give this space a little make over too. What are your plans for twenty-sixteen? Obsessed with that coat, Vanessa! Gah, I hear you on not giving enough time and effort to my own space, but I'm working on that in '16, too! Those trousers look amazing and the coat is also really nice. My plans for 2016 are to read more and spend more time on my blog. Love this post. Wow, you kook absolutely amazing! I love the coat and the trousers on you!! Love that cozy coat! One of my resolutions is to bring lunch to work more often and continue growing my blog! Love the coat, beautiful outfit! So gorgeous. 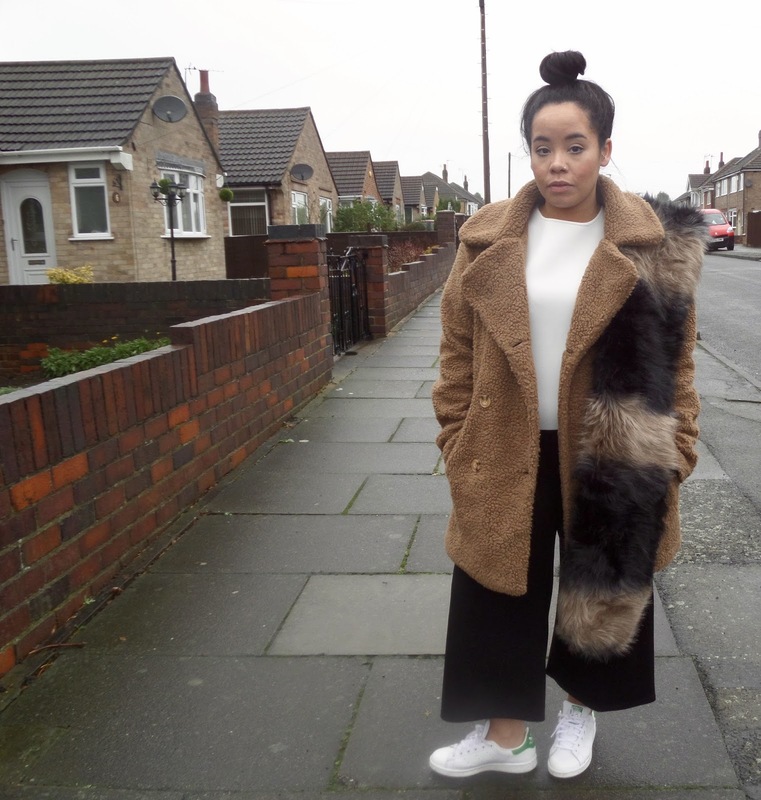 Loving this coat and how you paired it with culottes. I too have the same "New Years goal" regarding working on my blog! 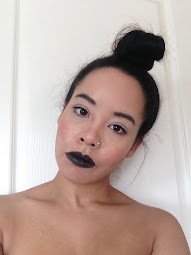 I was really inconsistent too, so I am trying to be a better blogger! Those shoes! And I love how you did your hair for this outfit. loving this ootd. I cant believe its gonna be feb soon. im guilty of not keeping up with my resolutions...but I think we are all guilty of that. lol. hope to see more posts soon. that scarf definitely adds up to the look, I love the style, and the colour. I really like this look! The coat looks great with the fur stole. I also like the sneakers! Love this casual look. 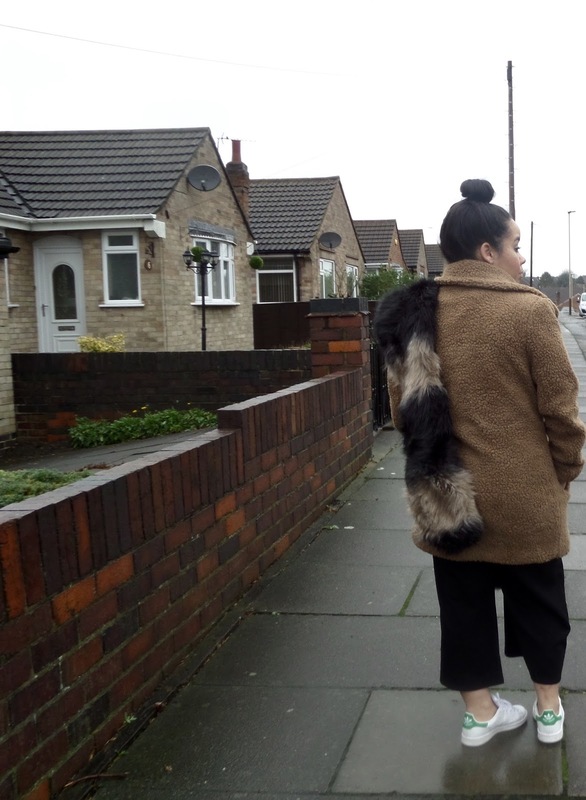 The Fur that is draped over the shoulder completely elevates this outfit. This look is doubly cozy with that coat and that scarf! I love this whole look. I think my favorite part is the shoes! Your hair is so cute in a bun too. Love it! Love the sneakers with this, lady! Lovin the faux fur scarf! 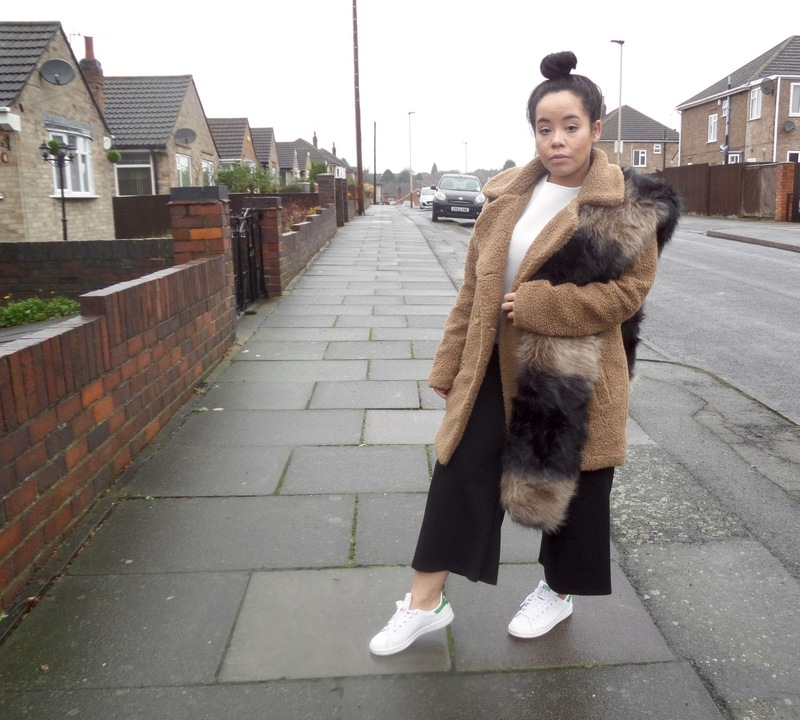 My plans for 2016 are to work on my blog more, move to London, and apply to grad school! Can't wait for your future posts! 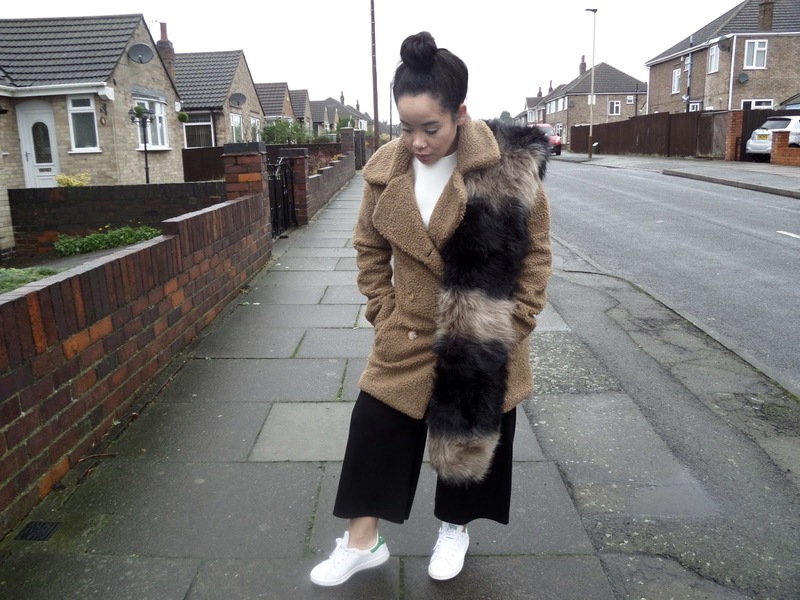 Love the teddy coat paired with sneaks!! Looking forward to the makeover! This cool outfit for party wear, I love the jacket & palazzo color combination. Lovely fur scarf.